"This is a wonderful Mexican dish." 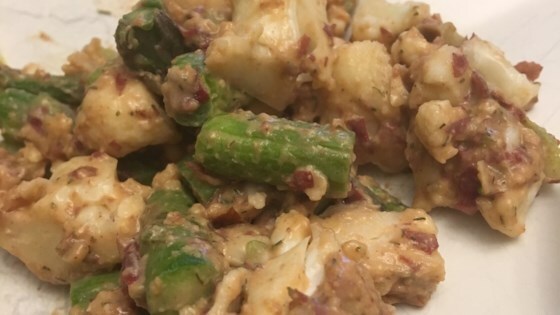 Steam asparagus and cauliflower about 10 minutes. Remove to a bowl, and stir in celery; set aside. Place into a blender the kidney beans, hazelnuts, dill, basil, and garlic. Pour in oil, and season with chili powder, celery seed, and salt. Puree until smooth. Pour sauce over asparagus mixture. Serve at room temperature. Looking at the recipe ingredients, it didn't look like things that should go together well, however it all comes together very well. Excellent taste, great use of vegetables. Thought the combination of ingredients sounded different and was happily surprised. Good addition to any Mexican meal! Made this with cabbage to serve with carnitas. Really quite good.